Whomever first thought it was a good idea to marry chocolate, caramel, and sea salt deserves a hug. A HUGE HUG. Even a kiss. And some kind of foodie award. These brownies are amazing! 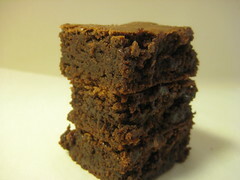 They’re chewy and cakey (think box mix texture), sweet, gooey, and salty. In one word: PERFECT. Make these now. You won’t regret it! Note: If you prefer your brownies dense and fudgy, use this recipe and make sure to double the amount of caramel and sea salt. Heat oven to 350 degrees. Butter a 9-by-13-inch pan. Melt chocolate and butter over low heat in a large saucepan. Beat in sugar and eggs. In a small bowl, stir together the flour, baking powder and salt. Stir dry ingredients into the chocolate mixture. Stir in nuts, if using. Pour half the brownie batter into the prepared pan. Drop half of the caramel sauce over the batter in dollops. Swirl into the batter. Sprinkle with 1/4 teaspoon flaked sea salt. Pour the remaining batter over the caramel and spoon the remaining caramel sauce in dollops over the top. Swirl into the batter and sprinkle the remaining 1/2 teaspoon flaked sea salt over the top. Bake 30 to 35 minutes or until the top has a dull crust and a slight imprint remains when touched lightly. Cool slightly and cut into squares. Anything with cocolate, caramel and salt sound heavenly to me! I can’t wait to make these! Would these be good very small (1-1 1/2″) for finger food at a cocktail party? Or are they too gooey? If so, would you use this recipe or the denser/fudgier recipe? Jami, I kept them in the fridge and they held up pretty well. However, I think may be a little hard to cut neatly into small pieces because of the gooey factor. Maybe you could cut them frozen though…? Wow. This is so delicious sounding. I will have to make these to celebrate having electricity again! I agree, the thing about salt in caramel really makes a huge difference. It’s as if the caramel’s being lifted to new heights! 🙂 Fudgey brownies are the best. Keep baking!!! One more question: how did you measure the caramel? Liquid measuring cup or scale? I just spooned it on as I went along…I ended up using about half the 12 oz jar, if that helps!